After being postponed several times, the 2007 St. Kitts Amateur Basketball Association (SKABA) season got off to an impressive start last Sunday. Basketball teams from both St. Kitts and Nevis formed a uniformed procession from the Basseterre Senior High School to Basketball City where the official opening ceremony took place. The president of SKABA, Glenn ‘Ghost’ Phillip, delivered the opening address at the event. In his speech, Phillip reminded players of the opportunities available to them through their involvement in a team sport. He also urged players to take care of the newly refurbished facility, which was made possible by the efforts of the St. Kitts and Nevis Olympic Committee (NOC) and the Ministry of Tourism, Sports and Culture. Following the opening remarks, the teams were inspected by the president of SKABA, along with Lloyd Lazar, Permanent Secretary of the Ministry of Tourism, Sports and Culture as well as other officials and representatives from league sponsors. Patricia Wilkins, representative of National Bank, which also sponsors the female division, assisted Phillip in awarding players for their performances in last year’s season. Individual players awards were handed out as well as championship trophies for each division. Donovan White, Country Manager for Digicel St. Kitts, addressed the teams and spoke to his company’s commitment to the sport. He also announced that for this year the champion team of the Premier Division will receive a monetary prize of EC$5000.00, while champions of the A-Division will receive EC$2500.00. Alphonso Bridgewater, president of the NOC also addressed the teams, asking them to respect themselves, the facilities and each other. He urged them to make an effort to keep this season as peaceful and civilized as possible. “It is about time for the basket-ballers to move on from the fighting”, he said. Phillip spoke with The Observer and expressed some of his hopes for the up-coming season. He also gave his sentiments as to how basketball contributes to the development of the community. Lloyd Lazar officially opened the season and the first two highly anticipated games commenced, much to the fans delight. S.L. Horsfords’ Ghetto Roots came up against TDC Berger Mc. 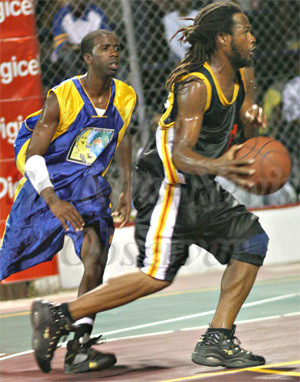 Knight Trotters in a fast-paced match which Roots won 70-67. The visiting Big Banana Express team from Antigua took on local 2006 Premier Division Champs RAMS Hitters in an exciting game. Hitters sent the visiting team packing with an impressive 75-63 defeat. The up-coming season promises thrills and excitement, and with an upgraded facility, fans can now look forward to seeing their teams play at full potential as they compete for the coveted championship trophy.